Yusuf al-Qaradawi’s deputy Abdallah bin Beyah resigned on Friday from the International Union of Islamic Scholars, a loud supporter of the Muslim Brotherhood. Bin Beyah, a 77-year-old Mauritanian living is Saudi Arabia, said in brief message addressed to the Secretary-General of the Union of Islamic Scholars that ‘the path for reform and reconciliation requires a speech that does not fit with my role in the Union,’ without clarifying the motives behind his abrupt resignation. Bin Beyah is a specialist in all four traditional Sunni schools, with an emphasis on the Maliki school of Madh’hab. In his youth, he was appointed to study legal judgments in Tunis. On returning to Mauritania, he became Minister of Education and later Minister of Justice. He was also appointed a Vice President of the first president of Mauritania. He is presently involved in number of scholarly councils including The Islamic Fiqh Council, a Saudi-based Institute. He is also a member of the Dublin-based European Council for Fatwa and Research, a council of Muslim clerics that aims at explaining Islamic law in a way that is sensitive to the realities of European Muslims. Bin Beyah was ranked amongst the 50 most influential Muslims in 2009. He has recently founded the Global Centre for Renewal and Guidance based in London. The Centre seeks to provide a true image of Islam, and promote the values of tolerance, and openness. Abdallah Bin Bayyah, last known to be living in Saudi Arabia, is a well known global Muslim Brotherhood figure originally from Mauritania. 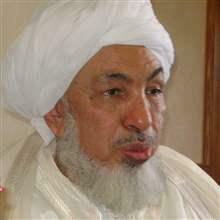 According to his biography, Sheikh Bin Bayyah was born in Eastern Mauritania and was the son of “one of the greatest scholars of his time.” Sheikh Bin Bayyah was taught Islamic subjects by his father and in his early 20’s, was sent by the Mauritanian government to Tunis to study Islamic jurisprudence. Upon his return to Mauritania, he became a judge in the Ministry of Justice. He was also chosen to be the head of the Shariah section of the court of appeals and later to “High Authority for Religious Affairs.” Sheikh Bin Bayyah held numerous government posts including Vice-President, Prime Minister, and Permanent Secretary of the People’s Party of Mauritania. Sheikh Bin Bayyah is a member of the European Council for Fatwa and Research (ECFR), the theological arm of the Federation of Islamic Organizations in Europe (FIOE) essentially comprising the European Muslim Brotherhood. The ECFR is headed by Global Muslim Brotherhood leader Youssef Qaradawi and both he and Qaradawi are known to be members of the Islamic Fiqh Council (Al Majma al-Fiqhi), the theological body of the Saudi Muslim World League (MWL) which was established in 1962 as a means for the propagation of Saudi “Wahabbi” Islam. The antisemitic nature of these theological organizations and other aspects of Sheikh Bib Bayyah’s antisemitism were covered in a post from last June following Bin Bayyah’s visit to the White House for a meeting with national security officials.